Waffle Wednesday! Is that a thing? If not, can it be? I’ve been making these whole grain spelt waffles almost every weekend; we can’t get enough of them. 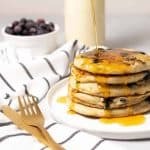 Lightly sweetened and filled with both whole grain and spelt flours, these waffles have quickly become our families favorite breakfast. Even Vander loves them! I just slice them into tiny strips and add a thin layer of peanut or almond butter for him. We’ve been practicing baby-led weaning and honestly, it’s one of my favorite things about being a mom right now. Making food and watching him light up as he eats it; I can’t get enough. 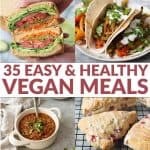 If you’re interested, I’ve been sharing our journey on a new Instagram page (Plant Based Juniors) and will soon be launching another website for all things on raising vegetarian babies. If you’re interested, you can learn more here. The great thing about these waffles is that they freeze so well. 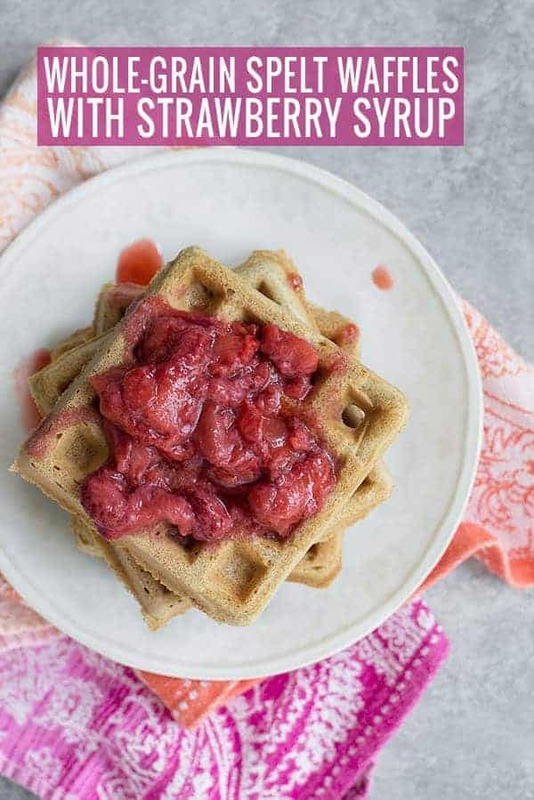 Just pop them in the toaster from frozen; they get just as crisp as when you first pulled them off the waffle iron and are perfect for quick weekday breakfasts. Since these are fairly low sugar waffles (only 1 tablespoon in the entire recipe), I make these savory by topping them with a fried egg or a little avocado and hot sauce. Of course, you can also serve them as written, with a delicious strawberry compote. I always have fresh berries in the house this time of year and compote is one of my favorite things to make when they are almost past their peak. Throw chopped berries into a saucepan with a little water, maple syrup and lemon juice, then reduce until thick and syrupy. Enjoy any leftovers with a little vodka and club soda- trust me on this one. 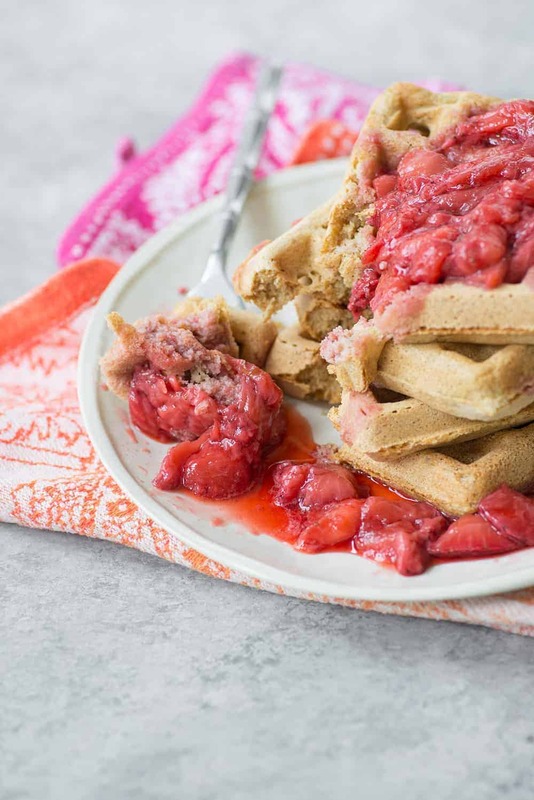 Low-Sugar, whole-grain spelt Waffles with Strawberry Compote! Looking for healthy waffles? Try these. 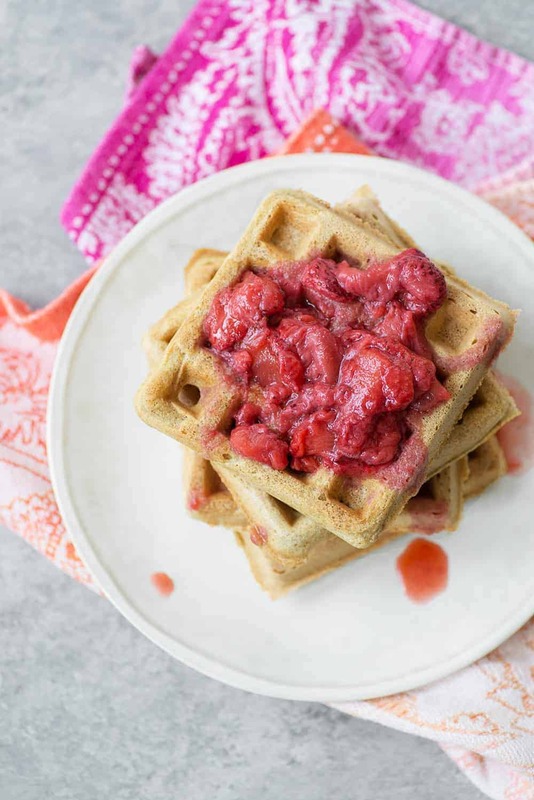 Low-sugar waffles made with spelt and whole-wheat flour. Topped with low-sugar strawberry compote sauce. Perfect for kids! Vander loves these! Whisk together the spelt flour, whole-wheat flour, baking powder, baking soda and salt. In a separate large bowl, whisk together the soy milk and vinegar mixture, butter, eggs and vanilla. Add the flour mixture to the wet mixture and stir until just combined. Let rest for 15 minutes. While the waffle mixture is resting, make the compote. In a small saucepan, add the strawberries, 1/8 cup water, maple syrup and place over medium heat. Cook until mixture thickens, about 10 minutes. Remove from heat and stir in the lemon zest and juice. Heat a waffle iron according to manufactures instructions. Cook until golden brown and crispy, then top with strawberry compote. I’ve been making these for my 7 month son, and I omit the sugar when I make them for him. They still turn out delicious, but aren’t very sweet. They are perfect for spreading with almond butter or avocado. Weird and delicious! I made my own “buttermilk” using soy milk and vinegar because I never have cow’s milk in my house. However, these will work with regular buttermilk OR regular cow’s milk with 1 tablespoon vinegar. These freeze SO well! Make them, then freeze individually. Once frozen, place in a freezer-safe bag and toast when ready to eat.